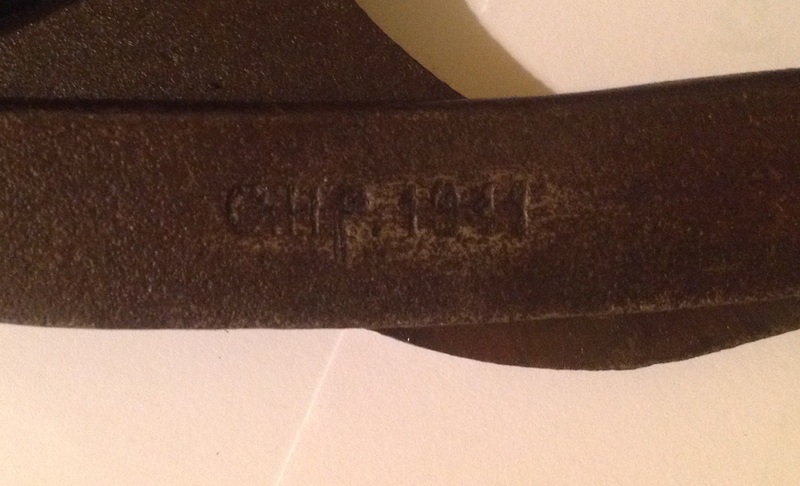 Many household and agricultural implements were also used by the military, these items were stamped with the WD /|\ mark just the same as more warlike items. Today’s item is one of these, a billhook. Billhooks are one of the most ancient hand tools used by man dating back at least as far as the bronze age, the design would be as recognisable to a Roman Legionary as it would to a British Tommy. The billhook is a tool designed to cut small woody plants such as shrubs and branches. The billhook is sharpened only on the inner face and is used by pulling the tool towards the user. 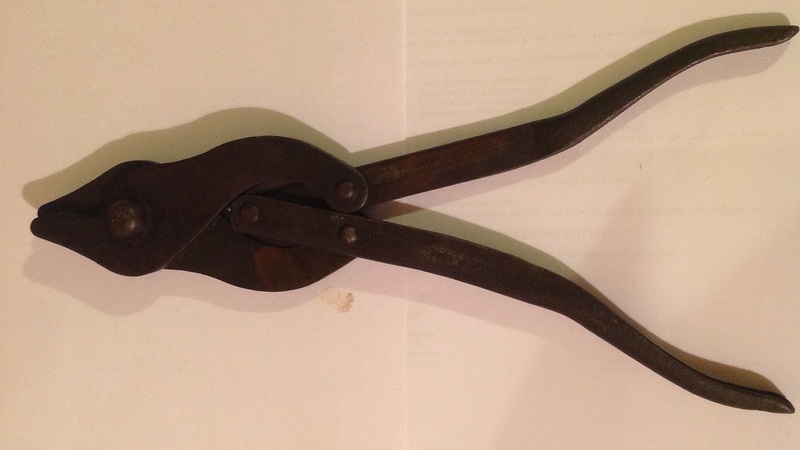 Billhooks have long found military use, either for clearing fields of fire or for cutting brushwood to make fascines and gabions for machine gun emplacements. This particular style of billhook is based on the ‘Pontypool’ pattern of billhook and this pattern was first used in the Great War, presumably because it was more robust for the sort of ill treatment that soldiers would give it. was issued with the 25 pounder field gun as an item of equipment in the limber to help clear suitable firing grounds. As far as can be ascertained these were never issued with scabbards- they were not meant to be carried by individual troops but were issued on an as needed basis. 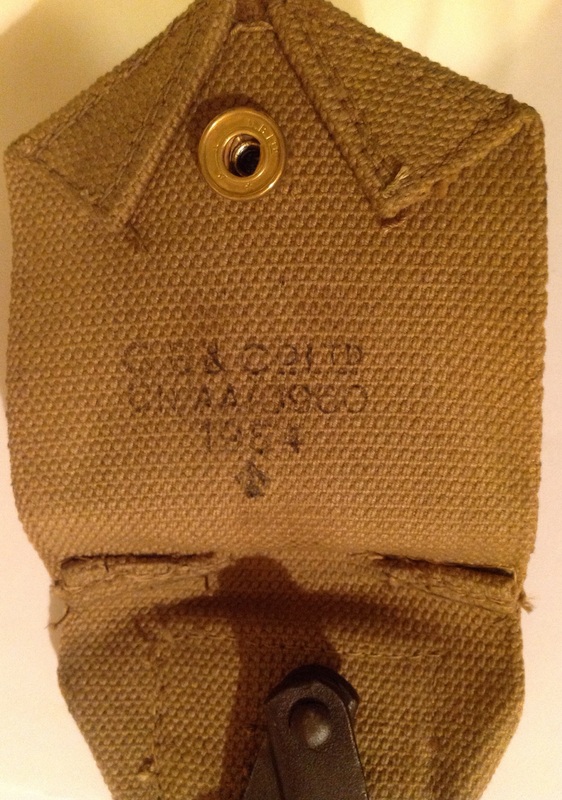 This entry was posted in British Army, equipment on October 31, 2014 by hatchfive. Following the Normandy landings, the US Army in most respects had far superior equipment and uniforms to their British and Commonwealth allies. However the harsh winter of 1944 and the German offensive in the Battle of the Bulge highlighted one area where the British had a clear advantage over their American cousins. 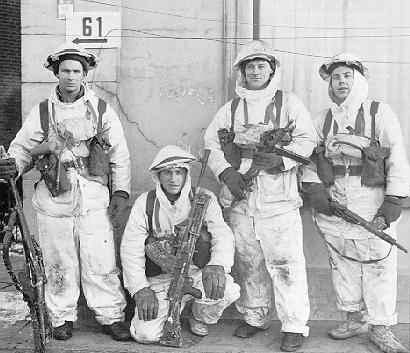 Whilst US soldiers were forced to improvise snow camouflage from liberated bed sheets, the British Army had a plentiful supply of white over-trousers and jackets. The white colour blended in with the snow blanketing continental Europe and the looseness of the cut helped break up the outline of the soldier. 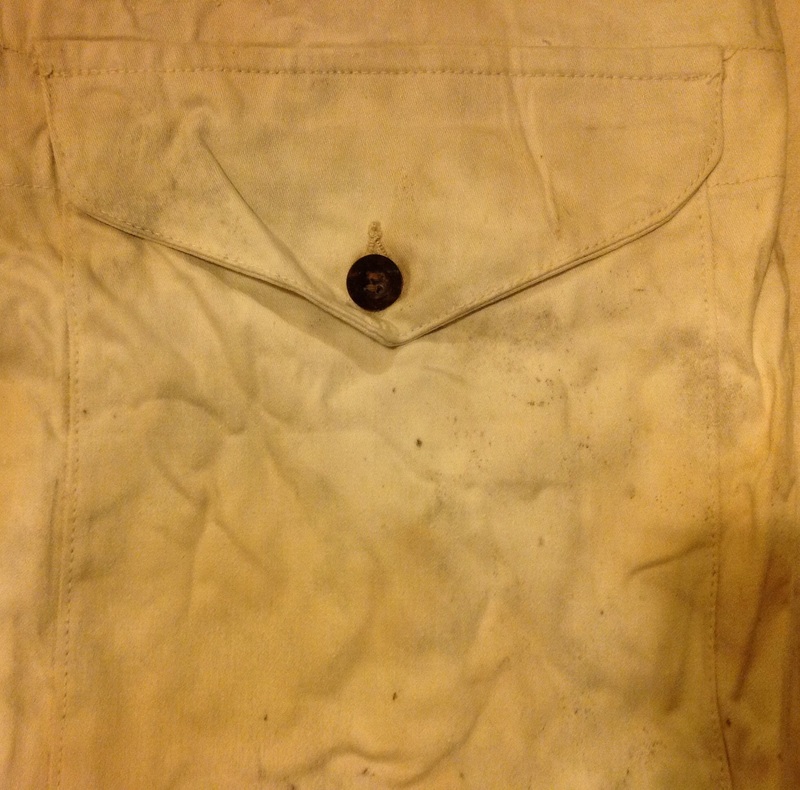 These baggy white cotton uniforms were simple garments designed to be worn over the soldier’s existing battledress, and seem to have had widespread distribution. 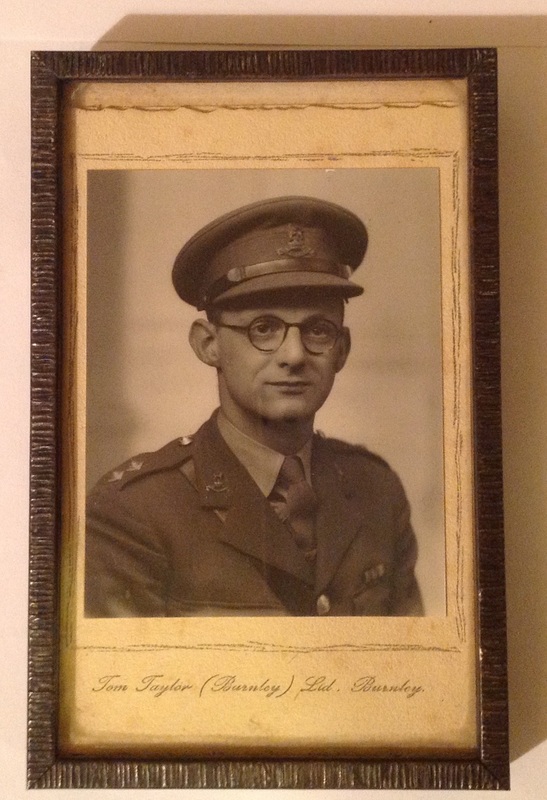 The earliest dates for these suits seem to be 1941-42, suggesting that they might have been introduced based on experience in the Norway Campaign. 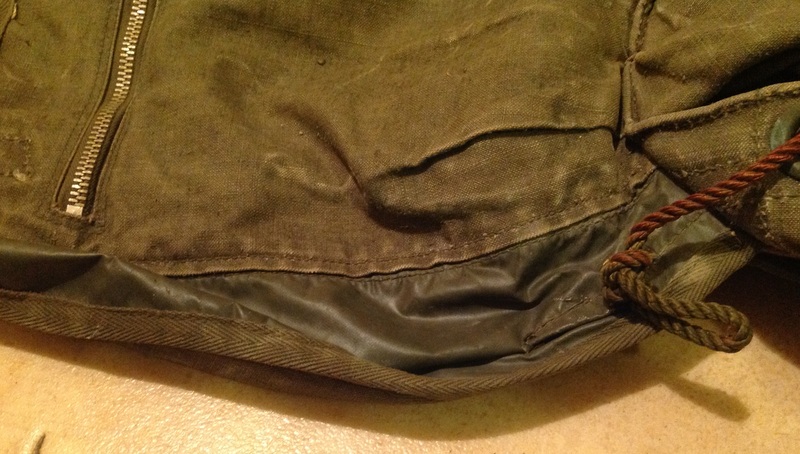 Regardless of the motivation behind their introduction, the snow over-suits were to prove invaluable once winter struck in 1944 and troops in the front line found themselves highly visible in the snow when wearing the dark brown battledress uniform. 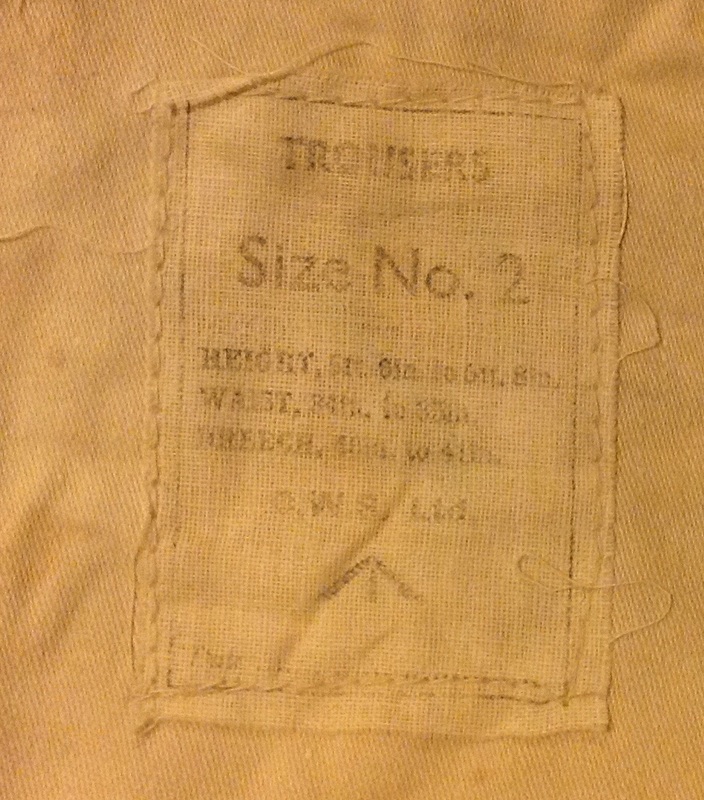 The large size range given on the label, from 5 foot 6 inches to 6 foot 8 inches, shows that the trousers were designed to be very loose and were never designed to have had a tight fit. 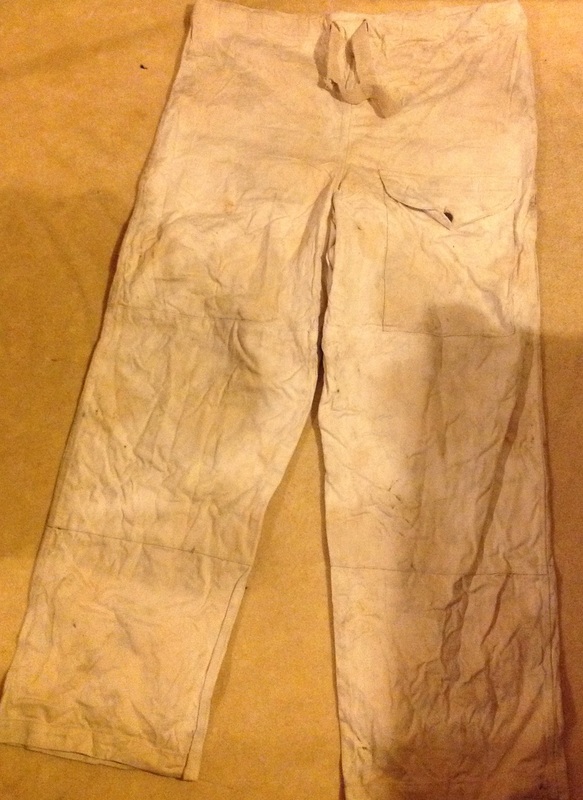 Unfortunately these trousers have a lot of storage dirt on them and I am still working out how to clean them without losing the details on the label. 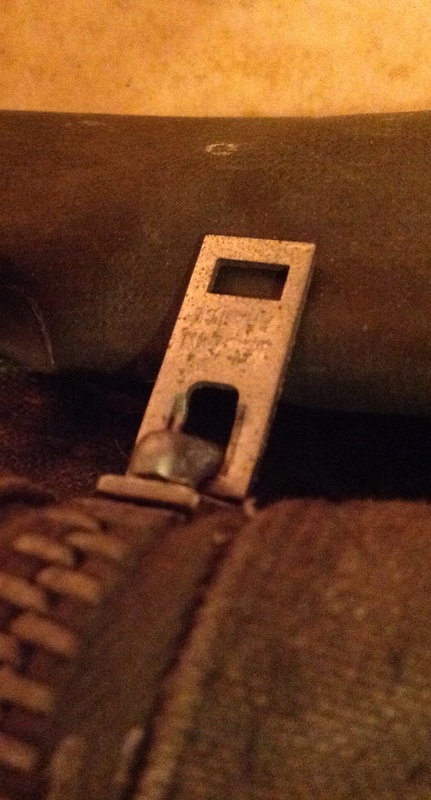 My current thought is to carefully unstitch the label, clean the trousers, and then reattach it in the original place. However given the unlikelihood I will be wearing these for re-enacting anytime soon I am in no rush to do anything that might potentially damage them. I also have a lead on a jacket to finish the set, but that will have to wait until more funds are forthcoming! This entry was posted in British Army, Camouflage, Uniform on October 30, 2014 by hatchfive. 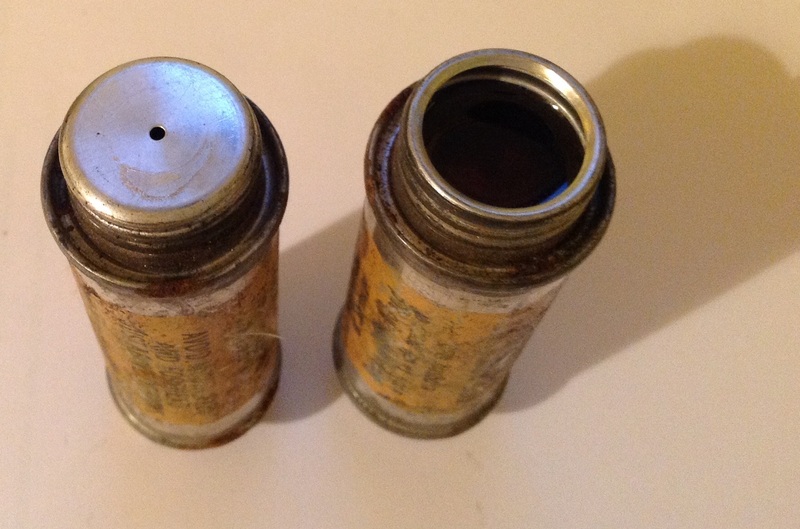 For many years these codes were something of a mystery to many of us, but thanks to the sterling work of a few members of the Warrelics Forum we now have access to a list of what the codes mean allowing collectors to date items in their collections. 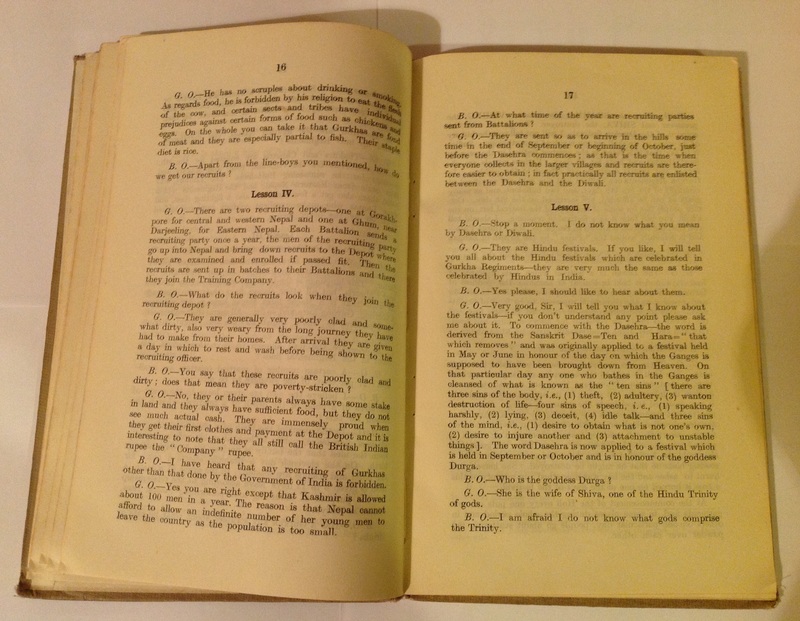 I hope the original poster ‘Anon’ wont mind me republishing the codes from the thirties to the fifties here for other collectors to take advantage of, hopefully they will be as useful to you as they have been to me! 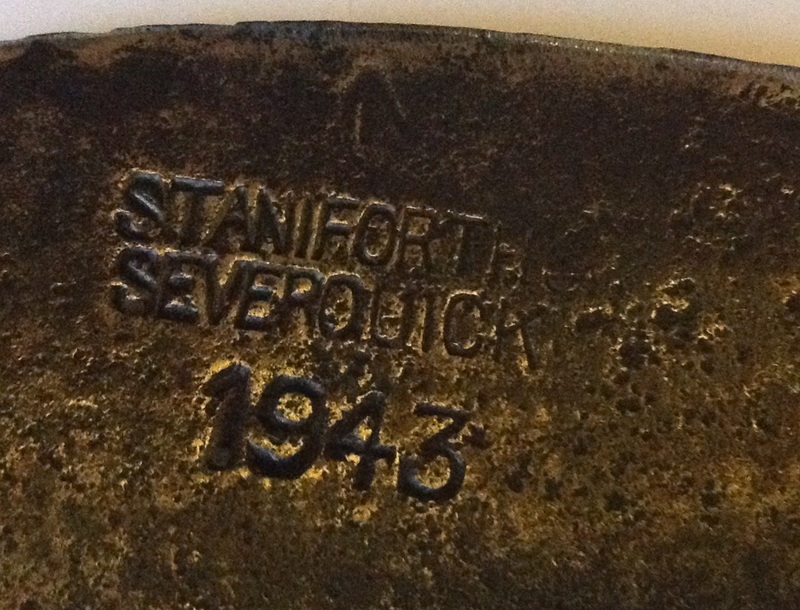 As can be seen some of the letters were repeated and the pattern jumps around a bit, but a combination of the letter codes and a basic knowledge of the rough periods of manufacture for certain items lets us date things pretty easily. 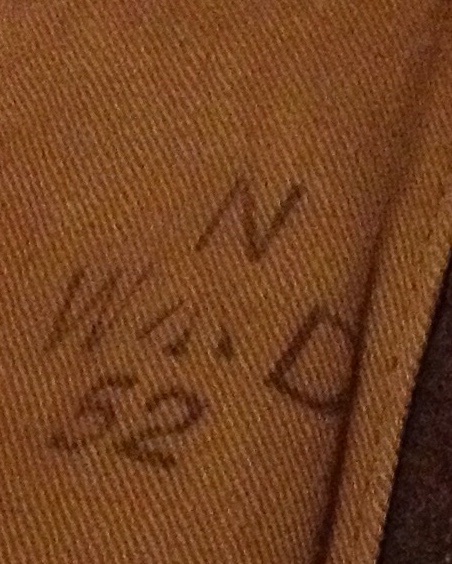 From this set of codes we can tell that the service dress jacket shown above with a code of N dates from 1943. 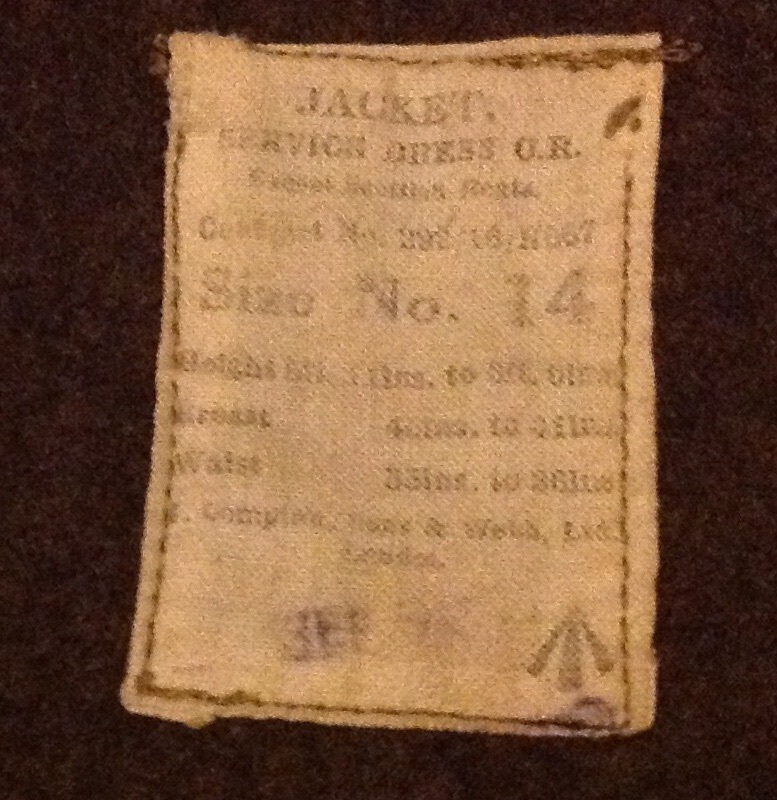 This entry was posted in Research, Uniform and tagged British Army, service dress jacket on October 29, 2014 by hatchfive. Today’s item is a letter from a larger collection of documents relating to an ATS officer involved with the administration of Casualties in the early part of the war. I will post further documents and transcripts at a future date, but this item stands out as being a touchingly personal one. Casualties are an unfortunate but inevitable part of war and it seems that the British had a pretty efficient system of informing loved ones of the fate of their loved ones, whether killed wounded or captured. 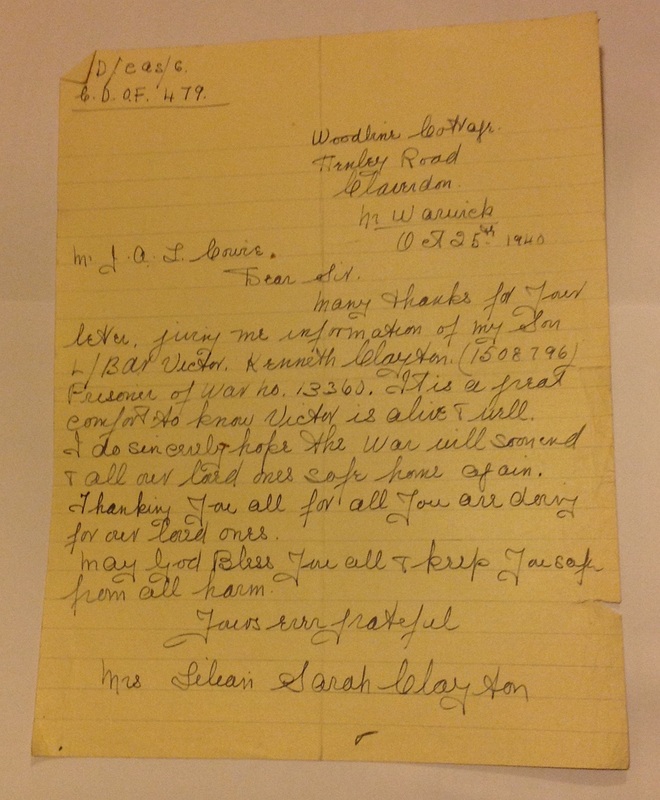 Many Thanks for your letter giving me information on my son L/Bdr Victor Kenneth Clayton (1508796) Prisoner of War no 13360. It is a great comfort to know Victor is alive and well. I do sincerely hope the war will soon end and all our loved ones safe home again. Thanking you for all you are doing for our loved ones. May God bless you all and keep you safe from harm. This simple letter is a window into the realities of the Second World War and how it affected loved ones far from the front. You can sense the relief Mrs Clayton must have felt at hearing her son was alive, and imagine the upset of her knowing she would not see her son again until the end of the war. 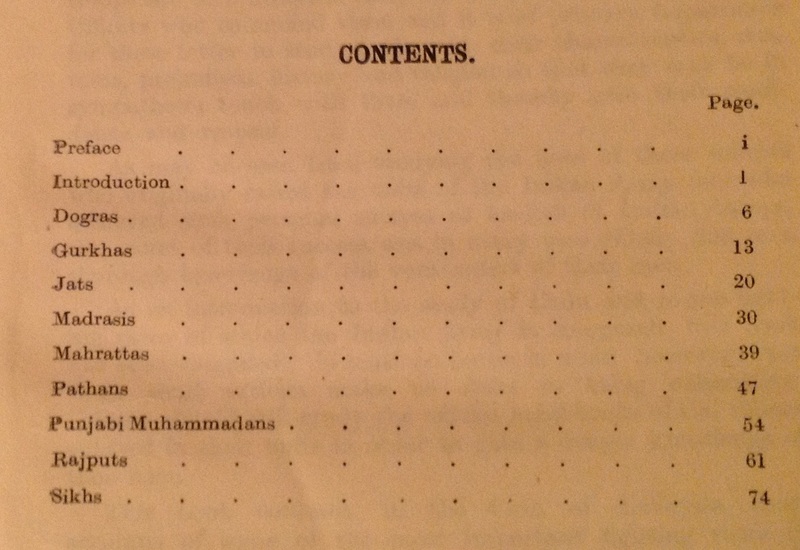 Once again as a collector I am struck by how little documents are valued. This letter was part of a much larger and historically significant set of paperwork, that was sold to me for a few pounds. I am very humbled to have been able to take custodianship of them for the time being, but one wonders how many more important and emotive items of ephemera have been destroyed by families and institutions who do not recognise their true value. This entry was posted in Documents, Uncategorized on October 29, 2014 by hatchfive. 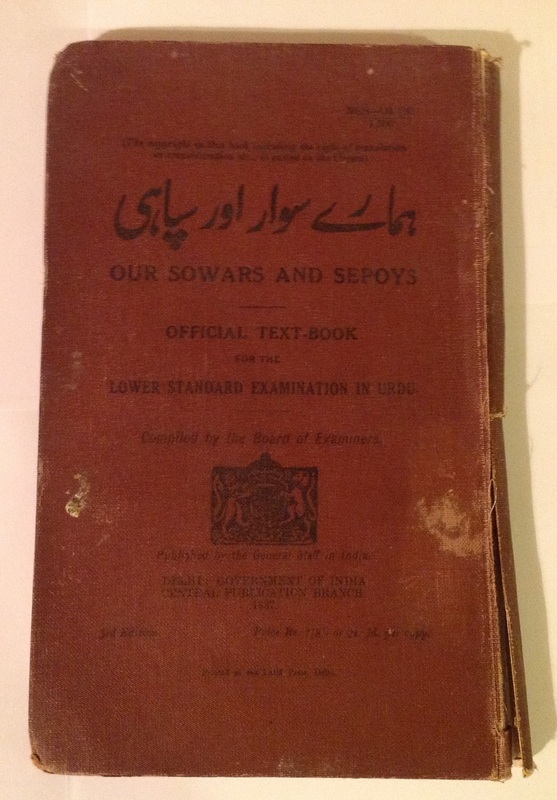 Urdu was the Lingua Franca of British India, with so many races making up the country with so many dialects Urdu allowed a simple language for the military and civil administration to use when communicating with the indigenous population. 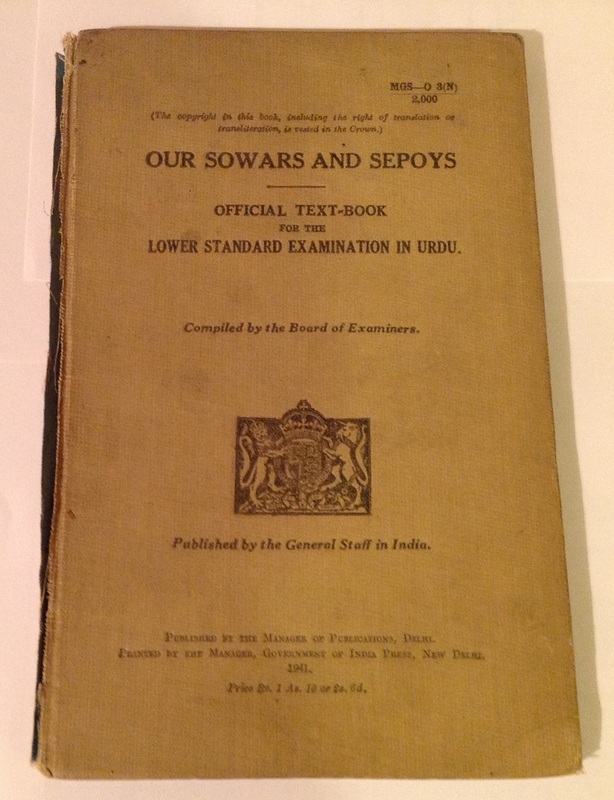 So vital was an understanding of the language that all civil servants and Indian Army officers had to learn it and pass an examination or face being returned to the UK and unemployment. 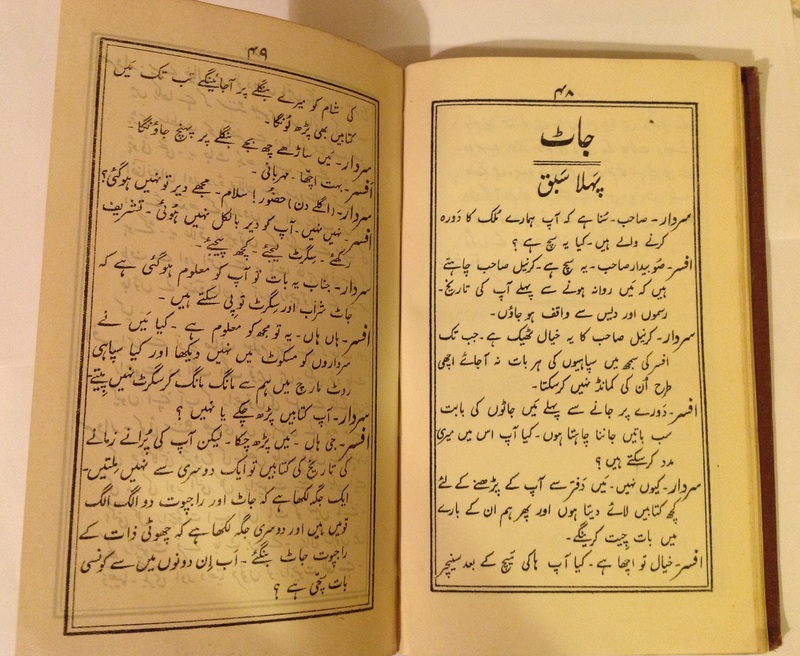 As I don’t read Urdu, I checked with a work colleague and the book is identical in content with the buff book. Presumably the idea was to read the two together so you picked up the Urdu at the same time you learnt about the tribes. I am told that the standard of Urdu is very high and this implies that the officer learning Urdu would have had to do it with a tutor rather than self taught. It also shows the high standards the Indian administration expected of its recruits. 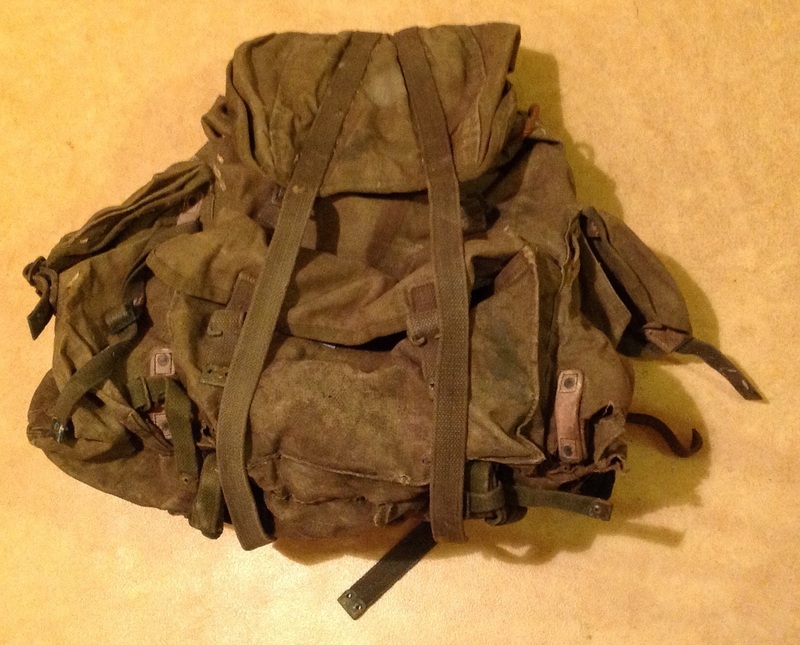 My plan at the moment is to clean up the bag and see if any more markings appear, and to post photographs online on the forums to see if anyone else can make a positive identification. For the price I paid I felt it worth a punt and I think it would benefit further investigation. 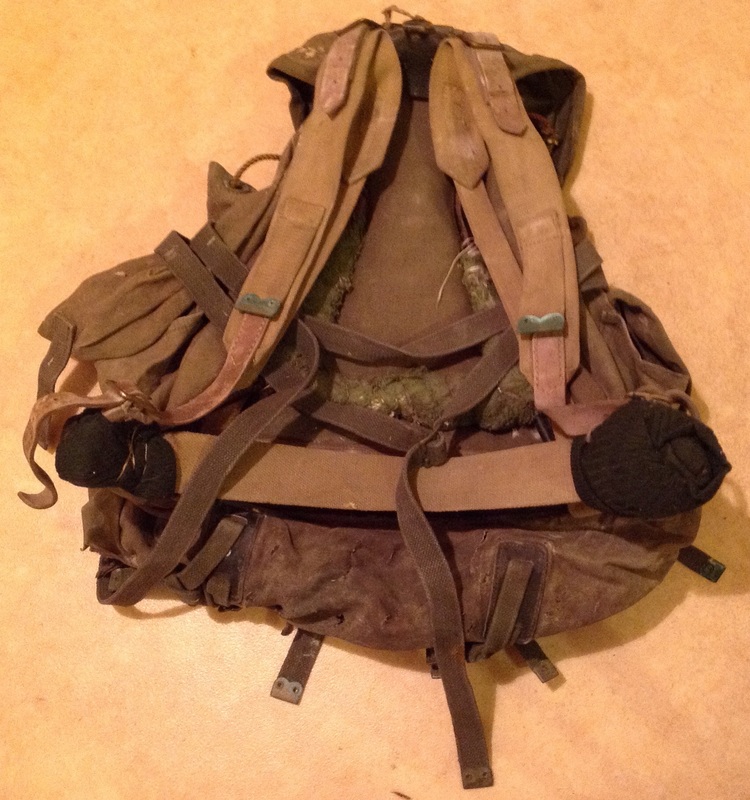 This entry was posted in British Army, equipment, India, Latest Pick Ups, Photograph and tagged Commando Rucksack, Indian Army, Urdu on October 28, 2014 by hatchfive. 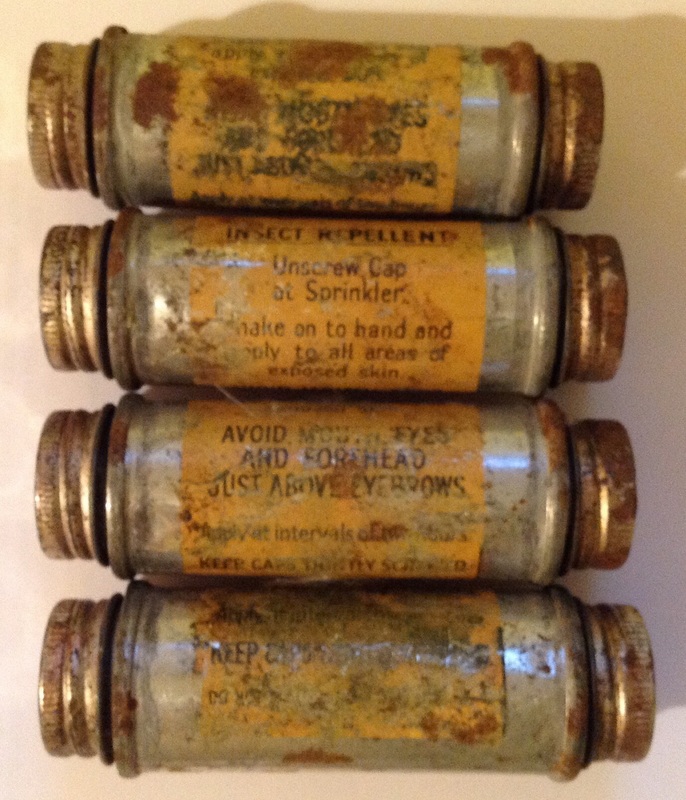 On the outside a yellow label says: INSECT REPELLENT, Unscrew Cap at Sprinkler. Shake on to hand and apply to all areas of exposed skin. AVOID MOUTH, EYES AND FOREHEAD JUST ABOVE EYEBROWS. Reapply at intervals of two hours. KEEP CAPS TIGHTLY SCREWED. 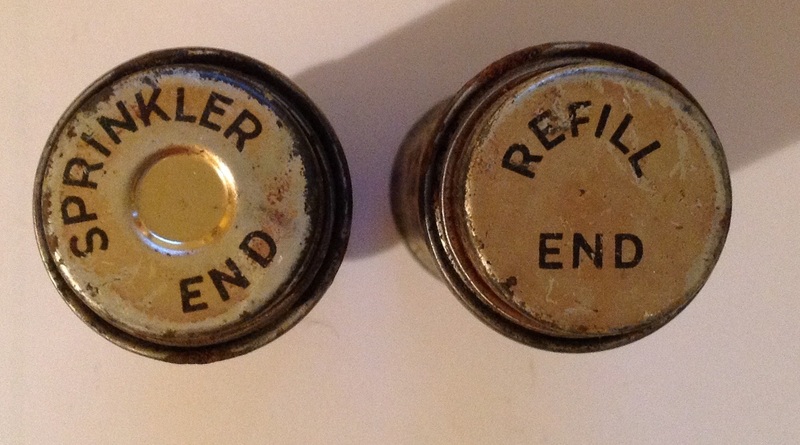 These tins are not in the best condition, but they are quite rare now and I got four tins for the going price for one on the collector’s sites. 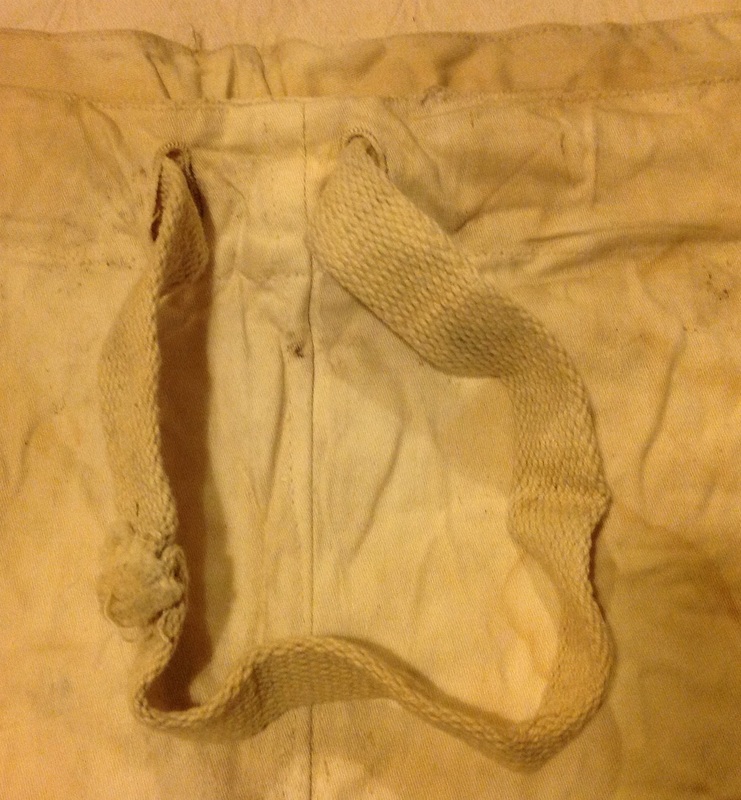 I will use a couple in my 44 pattern webbing set and Indian 37 pattern set, and display the two in best condition. This entry was posted in Uncategorized and tagged British Army, Jungle on October 25, 2014 by hatchfive.